Did you recently purchase a new home in Indianapolis, IN and don’t love the bathroom or maybe your older home’s bathrooms could use a make over? You can change the entire look of your bathroom with minimal money but still net big impact. Here are a few renovation suggestions for your Indianapolis, IN home‘s bathroom to give it a whole new look. Refinish your old, chipped, or dingy tub into nearly a brand new tub. You can do the project yourself for less money but it likely will take you longer than a professional. A professional could get the job done for under $500 and quickly. It’s time to replace those old vinyl floors or plain tiles. You can purchase porcelain or travertine tiles relatively cheap at your local improvement store. Go with a matte finish for a higher-end look. It is best to invest in a professional to install as bathrooms are quite tricky with all the fixtures needing to cut around. You can estimate doubling the cost of your tile square footage to figure for installation. Updating the lighting in your Indianapolis, IN home bathroom is the perfect DIY project. A new updated fixture can change the whole design scheme in the room. Also relatively inexpensive are bath fixtures. Fixtures in brushed nickel, antique bronze, pewter finished, or brushed chrome are good choices. A new fixture can help to spruce up an old plain tub or sink and give it more modern design appeal. I hope you can benefit from some of these design ideas for your home. 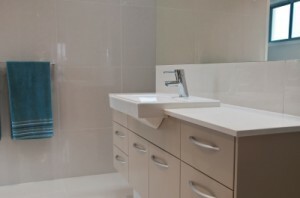 Should you decide you just can’t live with your bathrooms anymore and it’s time to sell your Indianapolis, IN home please look for a professional. From strategic marketing, and negotiation, a qualified professional is a home seller’s best asset. Your satisfaction is the key to our success. Don’t sell your home without the help of an experienced agent. Contact a Indianapolis, IN real estate agent when you are ready. We look forward to earning your business!